Thank you one and all - guests and dealers alike - for making this a busy and successful show. An especial thank you goes to the gentleman who exclaimed, "I've got to leave, I've spent too much!" as he exited the show. A big thank you goes out to the others, who like him, came to buy, sell and trade numismatics. On a sad note, thank you to all of the dealers and guests who signed the card for Mr. Harold Bowles's family. He passed away just before Labor Day. As one person noted in the card, "He was a fine gentleman." We know that to be true as Mr. Bowles spent many years as a dealer with us at the monthly show. The card will be sent to his family to show that he is fondly remembered and that he will be missed. Once again, this month's bourse had a lot of people buying and selling the precious metals, mostly gold and silver but some platinum as well. Of course, at a coin show, most of the metals are in some form of coinage though some dealers offer ingots as well. Some dealers offered fractional Buffalo gold coins at 1/10, 1/4, and 1/2 ounce weights. Plus, dealers offered gold year sets which included the 1/10, 1/4, 1/2 and one ounce gold coins for a particular year. In addition, foreign gold changed hands for the right price. In particular, one gentleman brought a 4 ducat coin from Austria to be appraised. Another person brought three gold coins, inherited from her mother, to determine their worth on the current market by asking the various dealers at the show. On a different note, a visiting dealer shared a few coins for viewing only. One was a seated dollar in a PCGS holder. Unfortunately, he noted that both the coin and the holder were counterfeit. Similarly, he had a raw flying eagle cent that was also a very nice copy. As part of his educational tale, he alerted the dealers that common bullion coins are also being copied, but some of them can easily be determined as counterfeit due to their insufficient weight. The heavy rains on Saturday evening washed the air and cooled the late summer temperatures. The show Sunday started with clouds, but later the sun beamed out of a beautiful clear blue sky. Though still warm, a touch of fall could be seen. The poplars with their yellow kissed leaves reflected the bright sunlight while the dogwoods showed off their red berries amid their red and orange leaves. This month, the hotel's event staff presented the coin show with another last minute challenge by reducing our contracted space dramatically. After much finagling with the smaller footprint, we developed a workable, albeit smaller, bourse layout. We appreciate the flexibility of our dealers and our guests, all of whom adjusted to the tighter space. The show was jammed for much of the day with the bourse staying busy later into the afternoon. Generally, several of our dealers, who have long drives, leave by mid-afternoon. Not this time, they stayed later too. Before leaving the show, one of our dealers, Al Adams, provided a copy of his new book, GOLD! At Pigeon Roost. 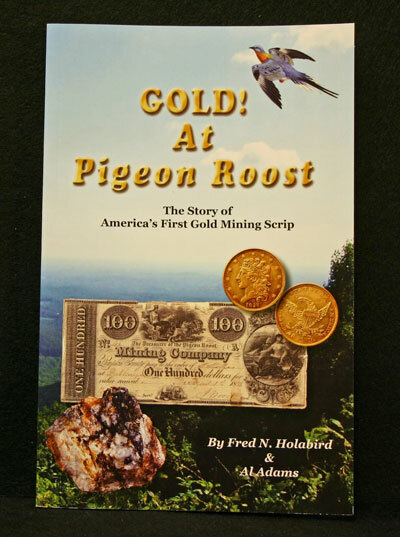 The book, which is described as "The Story of America's First Gold Mining Scrip," was a collaboration between Al Adams and Fred N. Holabird. The book also taps into Al's extensive knowledge about Dahlonega gold and provides interesting information about the gold and the mining efforts in the North Georgia mountains, America's first Gold Rush. For more information about the book, contact Al via email: info@goldrushgallery.com. Mark your calendars for next month's show on Sunday, October 10, 2010. We hope to see you there!